Please continue to use this thread for all discussion of the Treasure hunting on ACC. Everyone does when they log in. The missed Bells counter resets every time someone gets the Jackpot. can see a lot of ads. Also, my missed bells count is now 200 and I'm like "SAY WHUT." .~[quitting by 8/27. see yah. ]~. ^ If you are using IE it did that for me. Switch to another browser like Firefox of Chrome and it will work. ReeceUser - So far they have no real use. The SIC are thinking of things for them to be used as (in like a Bell Shop). Go here if you have any suggestions. TigerofPie: What extensions do you have? Maybe one of those is messing with the ads. I like this week's poll. It offers hope that serious consideration is being given for bell usage. Currently, it looks like there is a clear "mainstream" direction standing out. But if you all do opt for "special 'bell access' pages only", I do hope you'll give us more detail. A board that permits non AC stories perhaps... or a place where threads don't have to close down at certain points... or... or... who knows! The possibilities are quite intriguing. I wright. Therefore. I am. My question is, if someone misses the jackpot, would the percentage be added to the current jackpot? "@TigerofPie: What extensions do you have? Maybe one of those is messing with the ads." I have no extensions installed, nor do I use an ad blocker. What does the Wisp look like? If I forget to rate you please let me know. I'm not on ACC a lot, but since being on, I've redeemed two 100 bell adds, and I also missed one. 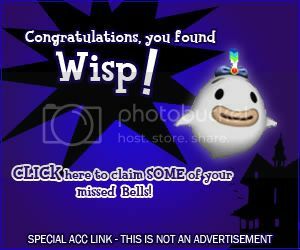 I got a Wisp ad, but it timed out. Right now, I have four hundred bells and no missed bells. People on here have said that the missed bell count resets with the jackpot, so I'm not worried about that. I'm worried about where the extra 200 hundred bells came from. I kind of feel like a thief, because I KNOW I didn't claim them. Oh I'm sorry, did I infiltrate your secret organization? Part of the ACC Crusade! Contact oochey if you want to join! Maybe you did but just forgot? It could be an error. I didn't forget. This is going to sound a little concieted, but I don't forget. My memory is impeccable. I have seen a few ads where the ad is the top part of ACC, like with the clock, jackpot number, facebook button, logo and stuff like that one it. Is that anything to do with the treasure ads? Find me: Minecraft Mike (Over 38K strong) WE ARE! I saw that this morning. Think it's a glitch. I was looking on the OT board when I found a 10,000 Bells ad. I clicked it and got the Congrats page. Then on the next page, it counted them as missed! THAT WAS 10,000 BELLS! GONE! You sure the page wasn't left open for more than 5 minutes?